💥 Julius Erving 💥 SF. 🎗 Autograph Veteran Prizm HOF Legend Signatures Parallel Card# S-JEV 🎗. ⚡️ Auto Autograph Prizm SP Legend HOF Card ⚡️. 2018-19 Panini Prizm Fast Break JULIUS ERVING DR J AUTO CARD 76ERS FB-JEV. Condition is Like New. Shipped with USPS First Class Package. 2018-19 Panini Revolution Julius Erving Auto Redemption On Card Dr. J. Condition is Like New. Shipped with USPS First Class Package. 2018-19 PANINI DOMINION JULIUS ERVING DR. J PEERLESS GAME USED JERSEY AUTO #15/49. Condition is Like New. Shipped with USPS First Class Package. New Listing2013-14 Crown Royale Julius Erving Silhouette Auto 76ers SSP! 21/35 Rare DR. J! 2013-14 Crown Royale Julius Erving Silhouette Auto 76ers SSP! 21/35 Rare DR. J!. Condition is Brand New. Shipped with USPS First Class Package. 💥 Julius Erving 💥 SF. 🎗 Autograph Veteran Choice Prizm Red Scopes Holo Refractor HOF Signatures Parallel Card# S-JEV 🎗. ⚡️ Auto Autograph Prizm Choice Red Scopes Refractor Legend HOF Card ⚡️. One 2015-16 Panini Threads Basketball Century Greats #14 JULIUS ERVING (Philadelphia 76ers) basketball card. Serial #16/99. Free shipping for buyers in the USA. USPS First Class Mail. International orders accepted (eBay Global Shipping Program). Customer satisfaction guaranteed. Returns accepted for 30-days from sale. Positive feedback will be left upon successful completion of sale and buyer’s positive feedback. Please send questions through eBay messages and we’ll respond as soon as possible. #1 -- Julius Erving"In-Flight Signatures Tie Dye Prizms" Auto card #12/25. Rewards Exclusive! The card up for sale is from the 2016-17 Panini- Select Basketball. (Canada Excluded). 2018-19 Panini NBA Hoops Red Julius Erving 76ers HOF AUTO 14/25. Condition is Brand New. Shipped with USPS First Class Package. JULIUS ERVING 2012-13 PANINI MARQUEE SLAM DUNK LEGENDS INSERT #7. Condition is Brand New. Shipped with USPS First Class Package. I grade cards using the Beckett Grading standards. Many new limited edition inserts and autographs are frequently not Mint. For higher value cards I will include specifics as part of the condition (white spot on corner, minor machine line on surface, rough edge). 2017/18 Panini Essentials ROCK THE RIM JULIUS ERVING DIE CUT 76ERS K9893. Shipped with USPS First Class Package. Thanks! This is a2013-14 Panini Signatures SILVER Julius Erving RARE card! This is a great card in great condition. This card is number 239 in the set.This card is SERIAL NUMBERED 09/15! The card is in near mint to mint or better condition. 2013-14 Crown Royale Julius Erving Silhouette Auto 76ers SSP! 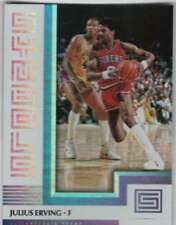 21/35 Rare DR. J!